Conveyor system for Transportation of car body in welding shop, paint shop and in final assembly shops. Control of production recourses using statistical analysis and optimization methods. Process of car body cleaning in EMU stations. Robot stations for sealing and painting applications Control of robots station in the process of the anticorrosive protection, sealing up and painting. Monitoring, control and optimization of control for resources in the production of car body. Systems of the wireless identification of car body and tracing the production of car body. Project of sotftware for BMW model X5 for lines: Framing, Motor Inner/Outer, SideFrame. Control System for the high-storing magazine for a varnish workshop. Conveyor Control System in Varnish Workshop in Mercedes Vito. The preparation of the M11A and M11B workshops for new ©koda Octavia production. The preparation of the M13 workshop (the final assembly workshop) for new ©koda Octavia production: the preparation of the wheel and EHB transport, the implementation of the new visualtization system based on Cimplicity PE HMI. Modernization of M11STS00 Operator Station in M11A Workshop. The modernization of the varnish cabin at the BC (Base Coat) basic color line – spraymate or AIR. The exchange of the standart varnish AIR machine fo three Duerr robots. PACSystems RX7i of GE Intelligent Platforms firm, PSS3100 of PILZ firm, CIMPLICITY PE HMI firmy GE Intelligent Platforms. Modernization of Conveyor system in M12B Workshop. Development of PLC software for control cabinets. The conveyor control system in the Skoda SuperB weld workshop. 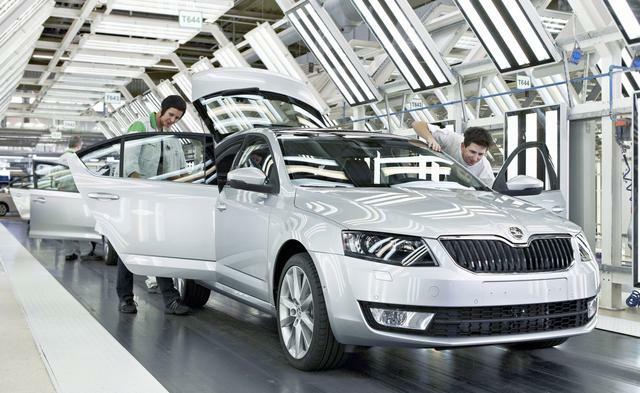 The conveyor control system at the hall join and in the Skoda SuperB final assembly hall. Control and Monitoring system of Varnish Workshop in Skoda OCTAVIA and FELICIA. Conveyor Control System in Final Assembly Workshop. The work optimalization of the technologic convey machines. Conveyor Control System of Varnish Workshop.